Lifesize murals are all the rage right now. People are seeking them out to boost their Instagram followers and to capture an urban feel in the cities that they’re visiting. 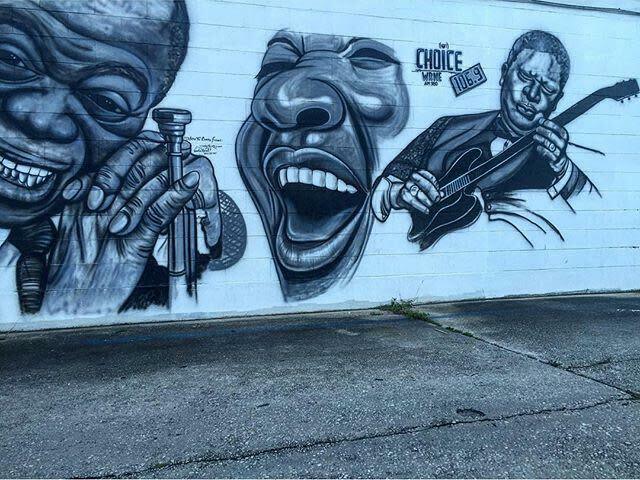 Read below for the most sought after murals in the Pensacola Bay Area. Located in the heart of East Hill Pensacola, the Brew Ha Ha murals are the newest and possibly the most popular murals in the city. The eatery isn’t even open yet and some of its painted pictures have been photographed over 300 times! This place is sure to be a must-stop location as it features the iconic Pensacola Postcard mural, but that’s not all. Visitors will also find a real life working train whistle and adjoining mural, a kissing booth and a cool hippie bus. 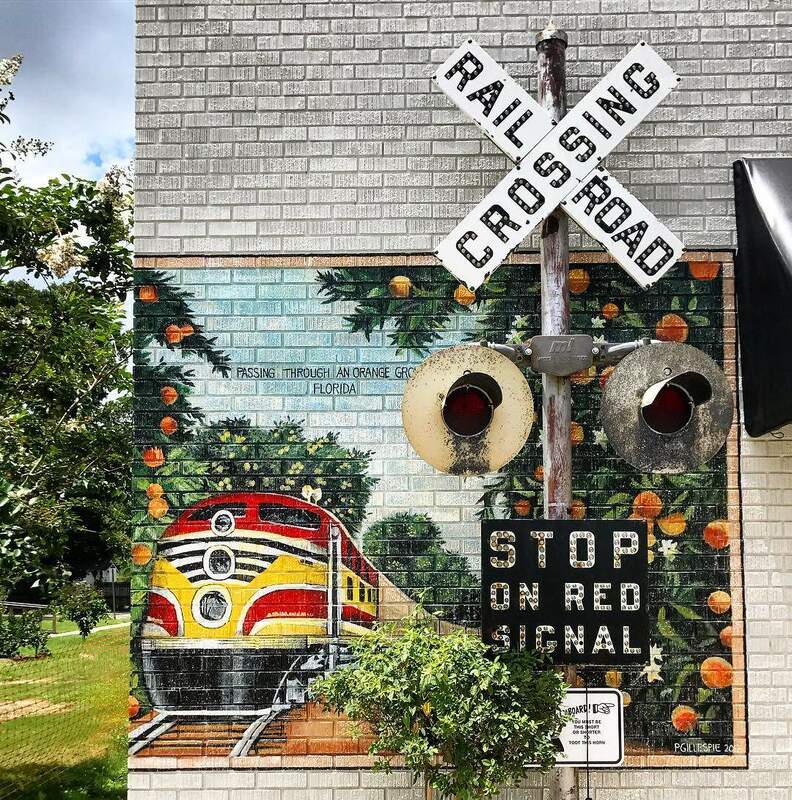 Once the restaurant is open guests will find memorabilia featuring Pensacola’s past from places like the San Carlos Hotel bar, the L & N Train Depot, the Blue Angels and souvenirs from The Graffiti Bridge. 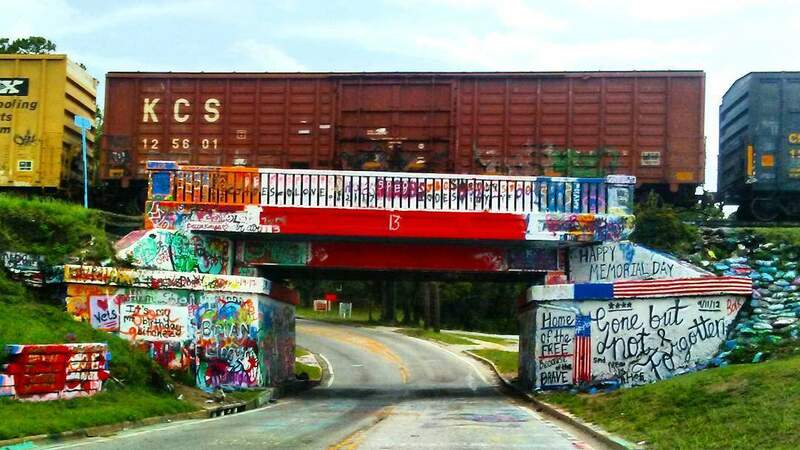 For those not familiar, the Graffiti Bridge is an old railroad overpass that has turned into an iconic landmark and work of living art in the Pensacola community. People have been painting, decorating, declaring and expressing on the trestle as far back as 1935 and guess what? It’s legal! Visitors and locals alike stop here daily to contribute and photograph the ever-changing mural. The most fun part is that there is a local guy that collects paint that falls off of the bridge and turns it into art and souvenirs! You can click here for more information. 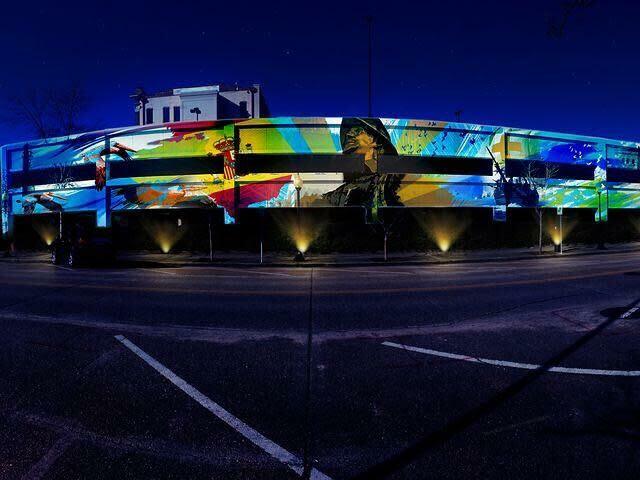 Spanning 3,000 square feet, the Jefferson Street Parking Garage mural is the largest mural in the city. The mural was commissioned by a mega-grant from Arts, Culture and Entertainment Inc. to liven up the streets of downtown Pensacola and to showcase over 450 years of history. People driving past can see images such as the Pensacola Lighthouse, Don Tristan De Luna, Spanish ships, pelicans and a Blue Angels jet. Once a thriving African-American community, the historic Belmont-Devilliers murals were planned to restore community pride and history. The first mural was installed at 314 North Devilliers Street and depicted the once thriving economic region. With the opening of Five Sisters and UWF’s Innovation Institute, the area is starting to once again tap into its roots. The murals serve as the epicenter of an artistic destination for those unfamiliar with the neighborhood and as a reminder of what once was. Great art doesn’t just promote a viewpoint or a conversation; it makes a tangible change. That’s what the Greater Pensacola Chamber Foundation’s LeaP Class of 2016 put into motion. While this one isn’t a mural I love the message and the fluidity of creation here. Titled, A Better Way to Give, this project recycles boring parking meters into works of art painted by local artists. The meters were designed to raise awareness of the homeless population in the city and to provide an alternative giving method to the homeless living on the streets. The funds collected from the meters coordinate with agencies addressing the challenges. 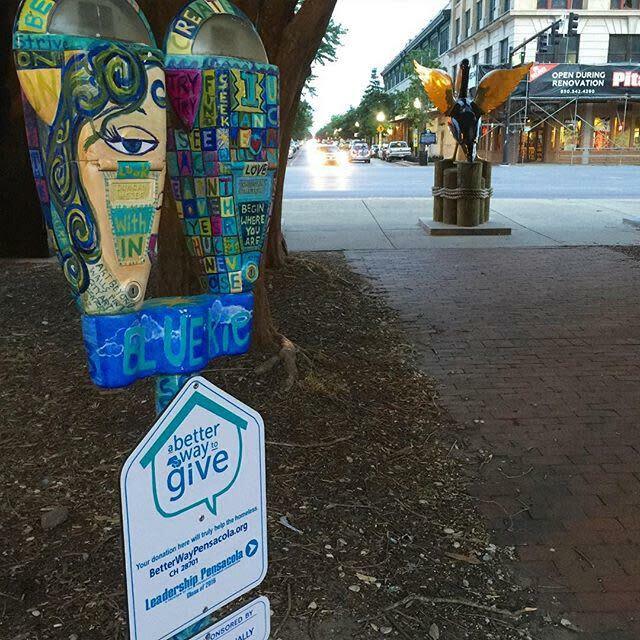 Look for these beautiful meters throughout downtown Pensacola. Fun Fact! First City Art Center, where the meters were painted, also has a HUGE mural painted on it that is everchanging, check it out here. Have a favorite mural that we missed? Tell us in the comments below!